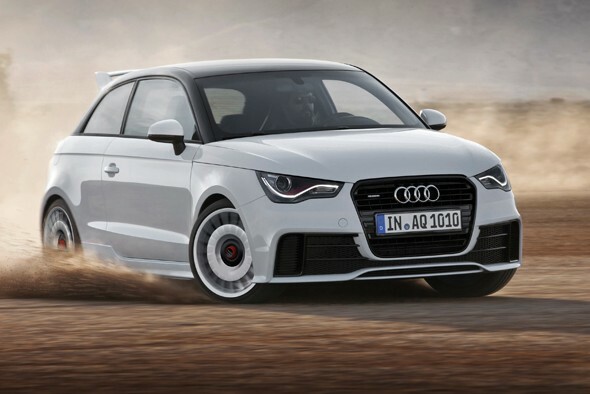 Audi has unveiled a limited edition hot hatch called the A1 Quattro. Only 333 will be made, each with a 2.0-litre TFSI turbo engine developing 252bhp, apart from one of them, which has a 60bhp diesel. Not really. Its output is almost 50bhp more than a standard Golf GTI, but in a body way smaller and lighter - so you can imagine how quick this thing is going to feel. setup (hence the name), traction off the line won't be an issue, and nor, presumably, will self-steering. With looks inspired by the mental, near-500bhp Clubsport quattro concept, this A1 has about as much visual punch as something so small and ordinarily humble could do. Sadly there'll be no right-hand drive version, and the level of interest will determine whether or not UK buyers will be able to get one; if you're interested, badger your Audi dealer now. It only comes in the spec you see here, which means a white paint job, Clubsport-inspired 18-inch alloy wheels, red 'wings' in the headlamps, a big spoiler and fat polished tailpipes. The standard kit list had the kitchen sink thrown at it. Once it had dried off, it read thus: DAB digital radio; sat nav; 14-speaker Bose stereo including illuminated sub woofers; Bluetooth; internet connectivity; leather interior with electric sports seats; light and rain sensors; rear parking sensors...bored yet? No prices yet, but it's thought it'll cost around £40,000 if it ever comes to the UK.